In a large bowl, mix 1 1/2 cups Sugar, Margarine, Shortening, Applesauce and Egg Replacer with a hand held mixer until the mix is smooth. Then blend in Flour, Cream of Tartar, Baking Soda and Salt with the mixer until the Dough is completely blended. The Dough will form these little balls - but that's OK. Shape Dough into 1 1/4 inch balls. In a small bowl, mix the Raw Sugar and Cinnamon. Roll the Dough balls in the Cinnamon Sugar. Place on an ungreased cookie sheet about 2 inches apart. Bake for 8-10 minutes but start checking on them around 5. Some of the smaller cookies were done after baking for 5 minutes. This will make 2 dozen chewy sweet & spicy vanilla-ish buttery cookies. 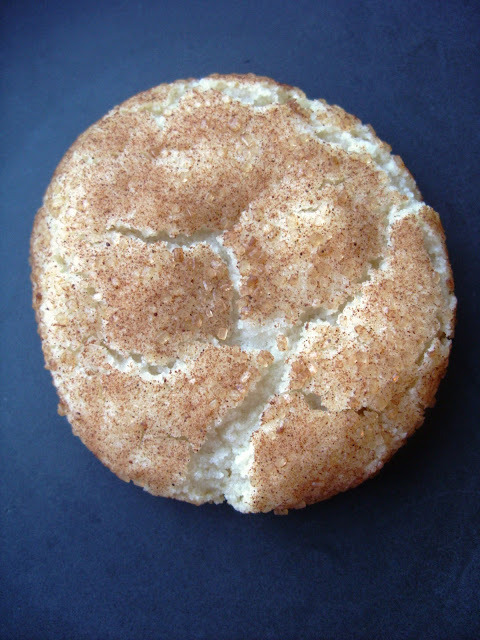 I have not yet mastered the Snickerdoodle. I've only tried once using the recipe from Vegan Cookies Invade Your Cookie Jar, but I failed miserably. I ended up eating a pile of buttery, flimsy cookies with a spoon. They never firmed up in the oven. I should give this recipe a try. I am allergic to apples....can I use oil instead? I'm not sure about the oil. The applesauce is replacing the eggs so I would replace them with 2 Tablespoons of ground flaxseed or 2 medium ripe mashed bananas. They won't be exactly the same but I think it should work.